While International Women’s Week is celebrated with great pomp and fervour globally; Mumbai also witnessed the celebrations at R-City Mall. 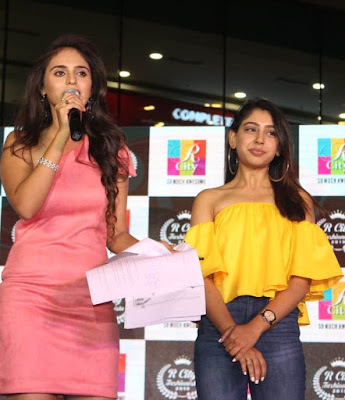 The mall which has become a synonym with shopping and entertainment conducted the second season of its annual event property ‘Fashonista’, wherein women shoppers from all walks of life enter an online contest to win the title. These contestants are then groomed and the grand finale round is of walking the ramp in front of a celebrity judge. This year R-City Mall received applications from more than 300 women out of which 10 made it to the grand finale. There were extensive grooming sessions which took place for over 9 days for these contestants. Actress Niti Taylor who is currently seen in Star Plus’s show Ishqbaaaz chose the winner along with other judges. Niti selected the winner and rewarded her along with the first and second runner ups. The show was full of special performances and dance acts, which further added to the delight. The ten shortlisted contestants walked the ramp at the grand finale of Fashionista. The cut-throat competition ended into a nail-biting finish with Dr Aachal Prakash winning the title and Ms Tripty Shetty and Ms Melina Fernandes being the first and second runner-ups respectively. It was a memorable evening for the contestants and their friends and families present over there. The patrons who had come for shopping were also enthralled by the high voltage competition. R-City Mall had celebrated the women's week by a host of activities which included activities like de-stressing sessions for the female shoppers, wherein female shoppers get pampered by free salon services like a make-over, hair styling, etc. There were caricature artists sketching the female shoppers, the art was then handed over the female shoppers as a souvenir.